Grimsho winning architectural competition for the South Korean Park logo ' one-of-a-kind ' Archi-new - Free Dwg file Blocks Cad autocad architecture. Archi-new 3D Dwg - Free Dwg file Blocks Cad autocad architecture. A spokesperson from Grimshaw Architects has confirmed to CLAD that the practice has won an architecture competition to develop a horse theme park in Yeongcheon, South Korea. The firm’s winning scheme, called The Park EverYoung, has been developed in collaboration with South Korean firms NOW Architects, Group Han Associates, Dohwa Engineering and DE Partners. 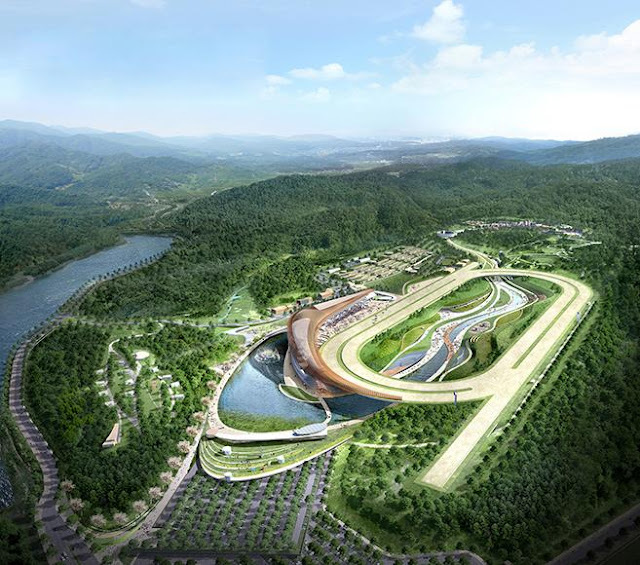 While detailed information on the design has not yet been released, a rendering published online by the The Korea Racing Authority (KRA) shows the site will be located in the middle of a forested area and will have a racecourse and spectator pavilion at its heart. Part of the track will be suspended over a meandering artificial lake. A landscaped path will be created to link the racecourse with a theme park located to the east. The KRA launched the international contest, called LetsRun Park Yeongcheon, in November 2015. It is investing KRW260bn (US$224m, €211m, £148m) in the venture and will develop the park on an undeveloped 1,475,000 sq m site (15,800sq ft). The authority said it wants to create a “one-of-a-kind unplugged horse utopia” to improve the overall image of horse racing, which is blighted in the country by its association with gambling and poor facilities. “We want the park to become a tourist destination that enriches the local economy and provides an exemplary model for theme park development,” the KRA said. The brief demanded the proposed parks are nature-friendly, consider the happiness of the horses and link local culture and horse culture through conceptual storytelling. Designers also had to consider the need for the theme park to be profitable in its own right, and not reliant on profits from horse races. The competition jury included Michael Dellis, a partner at PWP Landscape Architecture; Chris Johnson, a regional principal at Gensler UK; and Jong-Ruhl Hanh, chair of the Korean Institute of Architects. An awards ceremony and exhibition for the winning design will be held from 18-31 March 2016. The runners-up were teams led by Korean studios Dongsimwon Landscape Design – for their concept Journey of a Horse – and Designcamp MoonPark – for a park called Tracing Nature. They will be awarded KRW40m (US$35,500, €32,500, £22,000) and KRW20m (US$17,250, €16,250, £11,000) respectively.